Vusi Mahlasela and Ray Phiri, two true sons of the soil who have enriched South Africa’s musical landscape beyond measure over the decades, will receive Lifetime Achiever Awards at the 18th Annual MTN South Africa Music Awards. Both Phiri and Mahlasela have enjoyed success both at home and abroad, with Phiri played an integral role in the creation of Paul Simon’s Grammy-winning Graceland album and tour, and “The Voice” frequently performing abroad with the likes of South African expat Dave Matthews. 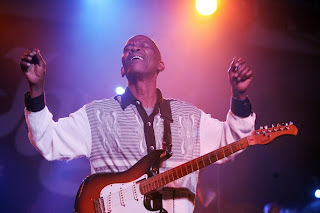 Raymond “Ray” Chikapa Phiri, who recently celebrated 30 years of hit-making with supergroup Stimela but who has been a professional musician since the 1960s, is undoubtedly one of South Africa’s music legends. In April 2011, President Jacob Zuma conferred the Order of Ikhamanga in Silver on him for “his sterling contribution to the South African music industry and the successful use of the arts as an instrument for social transformation”. It was awell-deserved accolade befitting a true South African music icon. Born in Mpumalanga, Phiri was a part-time dancer with the Dark City Sisters before founding The Cannibals, who would establish themselves as the country’s soul music giants in the 1970s. It was in the early ’80s that his long and eventful musical journey with African jazz-fusion outfit Stimela began. With Phiri as its charismatic frontman, vocalist and guitarist, the band released multi award-winning albums Fire, Passion and Ecstasyand Look, Listen and Decide (which went five times platinum), as well as the controversial People Don’t Talk, So Let’s Talk. 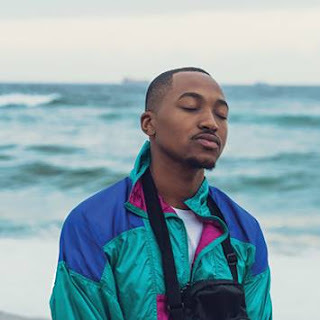 It was to come as no surprise when the track Whispers in the Deep was banned by the apartheid-era SABC – which only served to reinforce Stimela’s already burgeoning popularity. 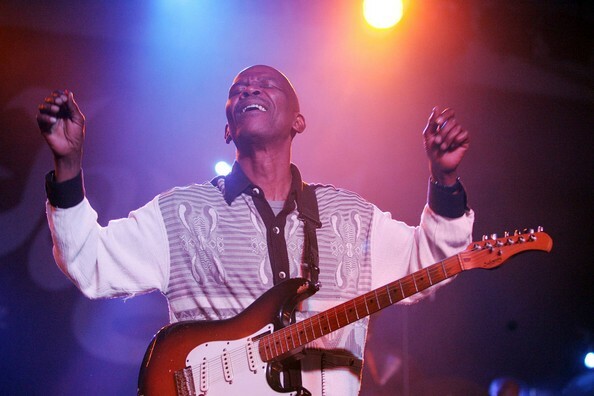 Phiri’s international breakthrough – which also placed South African music on the global map – came when he, Ladysmith Black Mambazo and other South African artists collaborated with Paul Simon on the groundbreaking Graceland project. He has since reunited with Stimela, which released their most recent album in 2010, and continues to play a pivotal role in cultural and educational circles. This is no exaggeration, for not only does Mahlasela embody the concept of ubuntu in his music, but he also conveys this overarching message with an intensity and clarity of feeling that commands immediate attention and affection. Mahlasela’s 1992 album When You Come Back announced him as a formidable newcomer on the music scene, and led to an invitation to perform at President Nelson Mandela’s inauguration two years later. Today, he continues to work as a 46664 ambassadorfor Madiba. His incredible vocal range, African folk-bluesy sound, poetic lyrics and strong social conscience immediately propelled the humble Mahlasela to prominence. He has since won legions of fans locally and abroad, touring extensively and collaborating and sharing stages with the likes of Josh Groban, Angelique Kidjo, Natalie Merchant, Paul Simon, Sting, Ray Lamontagne and his good friend Dave Matthews. 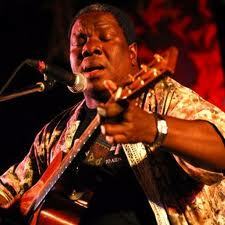 Mahlasela has now released three albums on Matthews’ ATO Records in the United States. His 2011 album Say Africa – recorded with South Africans Ian Herman (drums), Bakithi Khumalo (Bass), Mongezi Ntaka (guitar) and legendary blues-man Taj Mahal asproducer – topped the iTunes world music album chart in its first week of release, and was nominated for a 2011 SAMA. Despite his busy international touring schedule, Mahlasela remains true to his roots and performs frequently in South Africa, while supporting his Mahlasela Music Development Foundation and other charities such as the African Leadership Academy and the Desmond Tutu HIV Foundation. Mahlasela and Phiri will be honoured during the MTN SAMA 18 ceremony on 30 April 2012 at Sun City, in a special tribute performance. Tickets for the main awards show are available at Computicket, or catch all the action live on SABC1 at 8.30pm on the night. Get ready to toast our musical greats!